Tranfers cylinders on medium-duty applications. Features welded tank holders. Dual handle with vinyl grips. 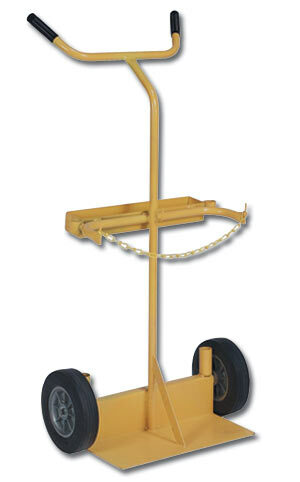 Includes 2 heavy-duty holding chains and tool tray. Green in color. FOB Shipping Point. No. Caster Type Base Plate Size; O.A.H. W x D x H Base Plate Size; O.A.H. No. Caster Type Base Plate Size; O.A.H.